1923 Ford Model T C Cab Street Rod, get in and HANG ON! If you're looking for a cool Hot Rod here it is! This is a beautiful 1923 Ford C-Cab fiberglass body rod from Anderson Industries. The frame was custom built to fit the body as well as the 402 cubic inch power plant. This engine not only looks mean it sounds incredible and is sure to turn heads every it's taken. 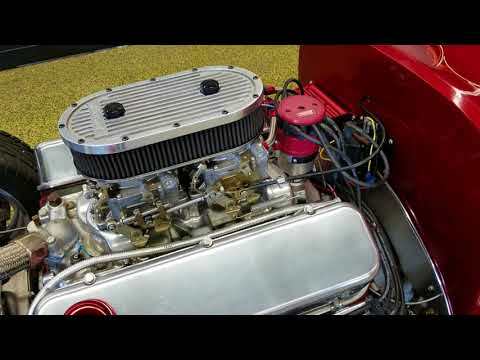 This 402 has a polished Edelbrock dual carb manifold with 2 4bbl Edelbrock Carburetors sitting on it. A Walker high flow alluminum radiator has been installed to keep this monster running cool. This 402 is paired to a TCI Turbo 400 transmission with a TCI 10" 3500 stall converter and the rear end is a Currie 9". The suspension is a Heidt adjustable coil over shocks rear and Heidt independent front end with disc brakes all the way around. This rod is riding on Billet Specialties custom rims that are 15x10 rear wheels and 16x7 front wheels. The paint on this vehicle shows well and is in very nice shape. You can take a look at the pictures and video and see how nice of luster the paint has. The interior has been finished off very nicely also with a custom built dash containing Stewart Warner gauges, Billet Specialties steering wheel, tilt steering column, and B&M shifter. If you have any questions on this Hot Rod give us a call at 507-386-1726 or email "sales@uniquemankato.com" FINANCING IS AVAILABLE AND TRADES WILL BE CONSIDERED.